Kremer’s spirit of long-term commitment to change and improvement extends beyond the vibrant walls of her home. 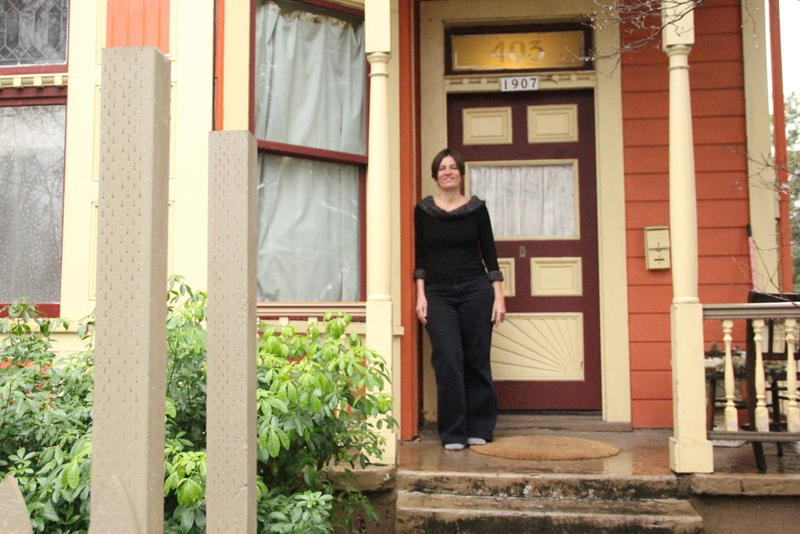 While working on affordable housing strategies for the Portland Development Commission she developed an understanding of the connection between diversity of housing types and diversity of people and took an interest in how her own neighborhood, one with a rich and complex history, was affected by these issues. “I liked the diversity [of the neighborhood]” Kremer explains, “but I didn’t fully know what that meant and now we’ve lost a lot of it in terms of ethnicity.” Demolition and lack of affordable housing, she says, are major contributing factors. She began attending some neighborhood meetings and learned that some area businesses and residents were resistant to the idea of adding more affordable housing. “As a mom I kind of realized I need to make a difference here in my own neighborhood, because that’s how kids learn. They see what you’re doing. They see if you’re making positive improvements or not. They see that and they can take part in that,” Kremer says. She decided she needed to get to know her neighbors better and find out how they could work together to bring about change. When former Mayor Sam Adams proposed a nearby baseball stadium in 2008 she began asking neighbors on the street how they felt about it and learned that traffic, parking, and trash from Trail Blazers games were all major concerns for Eliot residents. She saw a need for more neighborhood involvement in city plans for the Rose Quarter and Lloyd District and from there joined the Eliot Neighborhood Association and went to City Council with a resolution. Kremer worked with The Trail Blazers, the neighboring Lloyd District, and the Office of Neighborhood Involvement to create an agreement wherein a phone line was established for neighbors to call with complaints, and the Trail Blazers provided funding for neighborhood beautification, including the planting of street trees and decorative street painting to discourage littering. Kremer started a Beautification Committee with the Eliot Neighborhood Association and recruited volunteers to carry out these ongoing projects. “I’ve been able to get to know people because of problems. The problems bring people together,” Kremer says. The committee is currently working on getting sign caps made to help better establish the neighborhood’s identity. Since being elected chair of the Eliot Neighborhood Association in November, Kremer has identified a number of issues she wants to focus on. Addressing the impacts of gentrification and loss of ethnic diversity in the neighborhood is a major concern, which the organization’s Land Use and Transportation Committee hopes to address by working with the City to make changes to the Comprehensive Plan. Kremer has also made it her goal to make the organization more inclusive and welcoming and to work to retain new members. Encouraging more young people and renters to get involved and realize they can have an impact is among her priorities. “We don’t pay attention to neighborhoods and yet that’s the first line of involvement to have early planning impact in Oregon” Kremer explains. There are many ways to be a part of improving Eliot while learning more about the neighborhood and getting to know your neighbors, even for those who don’t have time to attend meetings regularly, for example, Kremer points out, volunteering to help paint a street intersection or working with a neighborhood business to build decorative trash receptacles using grant money from the Northeast Coalition of Neighborhoods. In addition to the Neighborhood Association, there are many other organizations in Eliot that are in need of volunteers or donors, such as Boise-Eliot/Humboldt School, Terwilliger School, Volunteers of America, Friends of Children, Dishman Community Center, and the collective gardens. “There’s a sense of investment in each other and that’s what makes an extraordinary group,” Kremer says.